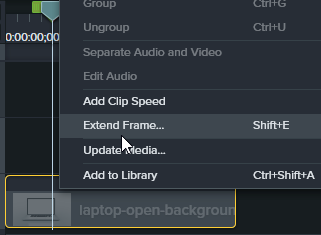 After adding a video asset to the Timeline in Camtasia, it's likely you'll want to freeze a specific part of the video to allow for other Timeline objects to appear (such as annotations or images). In the image below, I've added a video to Track 1 on my Timeline. When previewing, I noticed that the video ended too soon. I needed to freeze a portion of the video for 10 seconds so that overlay text added to a different track had time to appear and be read by the learner. I positioned the Playhead on the Timeline where I wanted to freeze the action in the video. Then I right-clicked the video (not the Playhead but the video object on the Timeline) and chose Extend Frame. 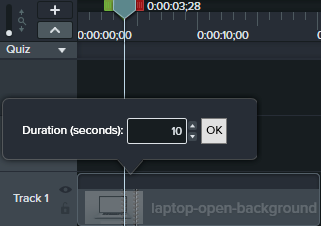 In the Duration (seconds) field, I typed 10 and then clicked the OK button. The change to the selected video was ever-so-subtle. In the image below, I've added the green and red arrows for emphasis. 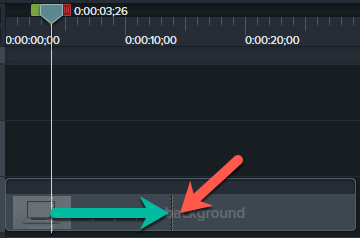 The red arrow is pointing to a thin vertical line on the video asset. The line marks the end of the 10-second frame freeze that I added via the Extend Frame option. The green arrow indicates the 10 seconds that the video has been frozen. Looking for TechSmith Camtasia training or support? Check out these hands-on, instructor-led classes. If you prefer something a little more private, we also offer one-on-one Camtasia mentoring, we've got you covered.